Many years ago, my son received a Thomas the Tank Engine train and a circle of tracks as a gift. He was two years old and could zoom Thomas around that track for hours, frontwards, backwards, crashing into imaginary obstacles. 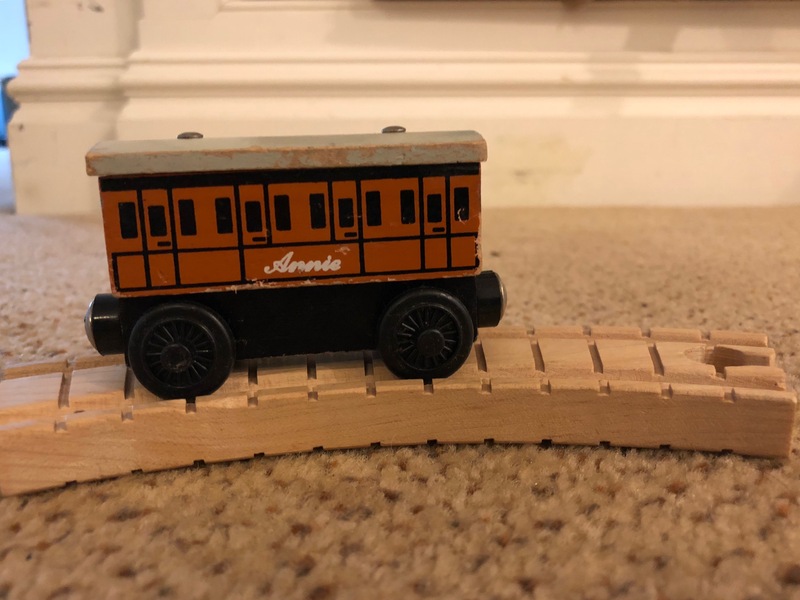 He loved it so much that I bought Thomas a buddy, his faithful passenger coach Annie. My son could not believe his eyes. Thomas and Annie chased each other around. They had fights; they made up. Those two trains were so precious to him that he always knew exactly where they were: one in each hand. Because these toys were such a hit, I decided to buy him twelve more trains and a more complicated set of tracks. This gift was received with the shock and awe that’s usually reserved for a twelve scoop banana split. It was the difference between watching The Mickey Mouse Club on a black and white TV and standing in the middle of Disney World. And in doing so I’d ruined the whole train thing. There were so many trains with so many names and different facial expressions that they became overwhelming. What were the rules of this new world? How did they all know each other? In a big pile, each one was just another train. I think about this all the time. I think about how I repeated this mistake with another child who loved his four Matchbox cars. They were always parked right by his bed at night so he could wake up and zoom them around in the morning. With the unbridled enthusiasm of an American consumer, I bought him a suitcase full of another 48 cars. We had Matchbox cars in every corner of our house, between every sofa cushion and under every bare foot. And that was the end of playing with cars. I think about how when I had a child in preschool and had only three hours of free time per day, I wrote a novel. If I could score another 90 minutes of free time via an after school play date, I would write two more chapters. Time was scarce and valuable and delicious. One whole hour was as tangible and precious as a much loved little train. Back then I knew exactly where all of my hours were. Now that I have all of my kids in school for what amounts to a full workday, it’s just different. I have nearly all the time in the world. An hour is of little consequence, so sure I’ll meet you for coffee. These castoff hours link together to make whole days, and suddenly the week has passed. One time I blinked and it was 2018. There’s luxury in abundance, but there’s discipline in scarcity. Someone on a budget knows exactly how much money is in her wallet. A game show contestant focuses all of his energy because he only has 25 seconds to come up with the name of the river that flows through the Republic of Namibia. If you gave me a whole day to figure that out, I’d open my laptop to Google it, start scrolling through Facebook and end up evesdropping on political arguments until it was for my nap. When you find yourself with a lot of something, it’s a challenge to keep sight of its value. Each little train, each hour matters. If I believed in New Year’s resolutions, mine would be to keep closer tabs on my abundant but precious hours.